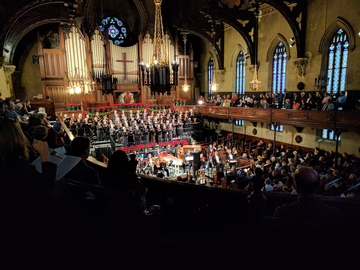 The Fort Street Chorale is pleased to present the 40th performance of Handel's Messiah. The members of the Fort Street Chorale and Chamber Orchestra are excited to work with Dr. Michael A. Mitchell, who will lead and conduct the ensemble in the 2018 performances. All tickets purchased online may either be printed or held at will call for pick up on the day of the concert. Tickets will be available at the door on the day of the concert and may be purchased by cash, credit card or check. Parking will be available near the church, but is not guaranteed. Street parking is also available. The Messiah concert will last 2 and a half hours with a 20 minute intermission. A cookie reception will be held after each performance. Handicap access to the building is available, however, there is not handicap access to the balcony seating.